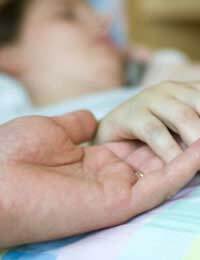 Home > Dangerous Bacteria > What is Bacterial Meningitis? Bacterial meningitis is a serious bacterial infection that affects thin membranes called the meninges. These surround and protect the brain and spinal cord. The fluid that surrounds the brain and spinal cord also becomes full of actively growing bacteria. This situation is highly dangerous and is regarded as a medical emergency. Approximately 5 to 15 per cent of people who develop bacterial meningitis die, but the risk of death can be reduced if the infection is diagnosed quickly and treated promptly with antibiotics. Despite the fear it generates, bacterial meningitis is not very infectious. It can be transmitted directly between two very close contacts – a boyfriend and girlfriend through kissing, for example – but it is not as highly infectious as flu or the common cold. The viruses that cause meningitis are much more likely to pass between people, but only a small proportion of them actually succumb to the disease. The symptoms of meningitis can develop very quickly and the person affected can become seriously ill within hours. Early signs include a very bad headache, a high temperature and a stiff neck. Nausea, vomiting, lethargy and confusion are also common symptoms and the eyes also become very sensitive to light. The infection advances rapidly and if the bacteria enter the blood stream this causes septicaemia. As the bacteria grow in the blood, they release toxins that break down the walls of blood vessels. The very small vessels in the skin start to burst and a rash develops on the body. This does not disappear when compressed under a glass object such as a jam jar as it is not caused by typical spots. Convulsions, also known as seizures may also occur where the body jerks and twitches uncontrollably. Convulsions are caused by the effect of the high body temperature on brain function and are a sign that the infection has progressed to an extremely dangerous level. In addition to carefully recording the physical symptoms in a patient with suspected meningitis, a doctor will also remove a sample of spinal fluid using a technique known as a spinal tap. This is then sent to a hospital laboratory. As a first step, the fluid is examined using a microscope to see if there are any obvious signs of bacterial infection. Then, some of the fluid is cultured on agar plates that are incubated at body temperature for several hours. The bacterial colonies that grow can then be tested to see which bacterium is responsible for the infection, and to see if the organism is resistant to any of the commonly used antibiotics. This helps to determine the best possible treatment that will have an effect in the shortest time. It is important that anyone who develops the symptoms of headache, stiff neck and temperature sees their GP immediately. It is better to have a false alarm than to have unrecognised meningitis. Antibiotics are more effective the earlier they are given and it is important to start treatment as soon as possible. A delay of 2 or 3 hours could mean the difference between life and death. Children and the elderly should also be given the vaccines that are available against the bacteria that cause most cases of meningitis. The disease can kill people of any age but the young and the elderly are most at risk, so this is a sensible precaution.